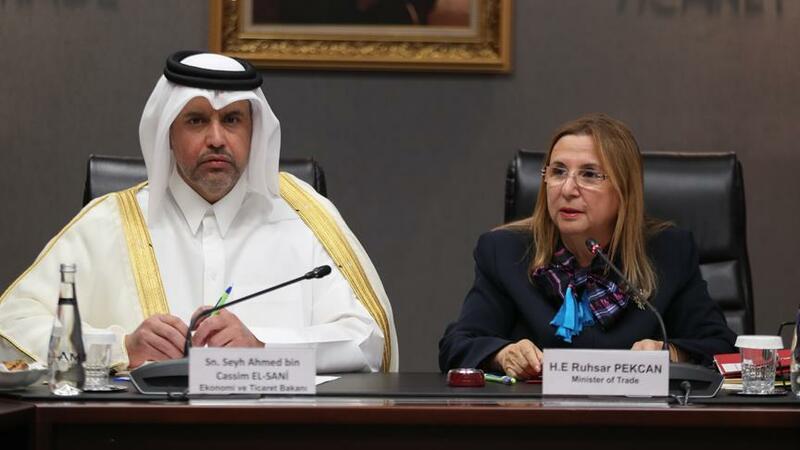 (QNA /Ankara) - Qatar and Turkey yesterday signed a bilateral economic partnership agreement. The agreement aims at cementing trade exchange and easing restrictions on investments, trade in services and e-commerce in addition to promoting co-operation in customs, education, research and development and capacity building as well as organising exhibitions, forums and economic conferences. During the meeting, the two sides reviewed bilateral relations between the two countries and aspects of joint co-operation, especially in relation to the economic, trade and investment fields, and means of enhancing and developing them. The agreement is the first of its kind signed by Qatar with a business partner and is a culmination of the efforts of a number of concerned bodies in the country such as the ministries of Economy and Trade, Foreign Affairs, Energy and Industry and Justice in addition to Qatar Central Bank and the General Authority of Customs. Following the signing of the agreement, HE Sheikh Ahmed bin Jassim bin Mohamed al-Thani affirmed that the Qatari-Turkish relations have witnessed a growing development and continuous co-operation in various fields especially in the fields of trade, economy and investments, adding that this agreement will increase the volume of trade exchange and facilitate the flow of goods, services and investments between the two countries. Qatar and Turkey have close economic and trade relations, that have been positively reflected on the volume of trade exchange, which exceeded QR24bn during the past five years. Turkey is the ninth source of imports of Qatar. The trade volume between the two countries is expected to increase by over 30% in the current year, especially after the establishment of a commercial corridor from Turkey to Qatar that has facilitated the flow of goods between the two countries as well as benefiting from the provisions of the agreement on trade and economic partnership, under which Turkish market demand for Qatari petrochemical and aluminium products will increase. Several trade agreements and memorandums of understanding have been signed between the two countries, including an economic and technical co-operation agreement, an agreement on encouragement and mutual protection of investments in addition to a memorandum of understanding on facilitating transport and transit traffic to strengthen economic, commercial and investment co-operation.